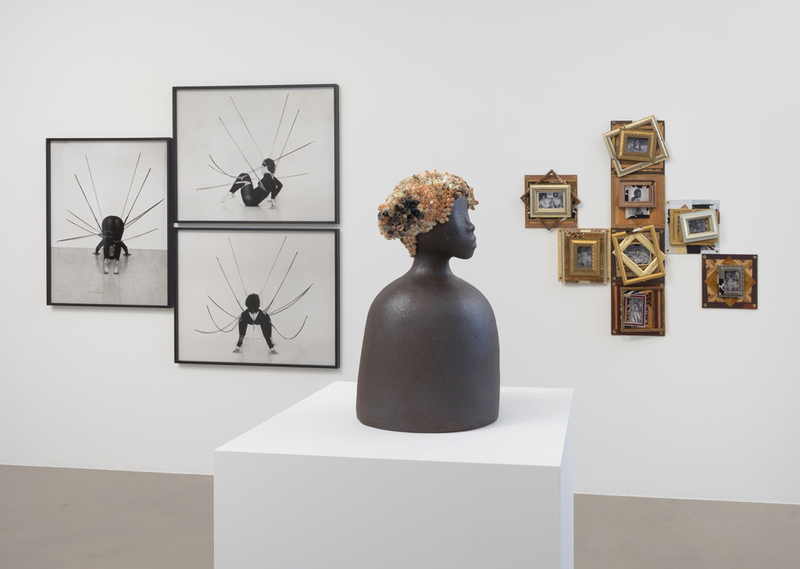 Installation view of “Power: Work By African American Women From The Nineteenth Century To Now,” curated by Todd Levin, 2017, at Sprüth Magers, Los Angeles. On Tuesday, I received an email from a friend with a gentle message stating the exhibition “Power” at Sprüth Magers in Los Angeles received a bad review in ARTnews that included a mention of my name because I contributed the catalogue essay. I told my friend not to worry—as an art historian I know bad reviews happen to even the best shows. This is par for the course of putting something up in the world—it will and should be critiqued. As a working critic, I have often lamented the lack of negative reviews in the art world. Clicking on the link to Catherine G. Wagley’s review, I read it with a special interest because as a scholar of mid-century art with a focus on African-American praxis I have a conflicted relationship with large survey exhibitions based on identity. However this review missed a great opportunity for criticism and instead delved into the populist name-calling and bullying that seems to be so common in the art world today. And for that reason, I find this to be a far greater offense than a bad review. When I came upon the line “Todd Levin, who is white,” it read as a strange interjection. I wonder if the critic contacted Todd Levin2 to ascertain his whiteness or if Wagley had his genetic biometrics on hand, since a byproduct of slavery is that blackness has been defined by the “one-drop-rule” and so individuals who don’t look black but grew up in black cultures identify as black. Or individuals such as our former president, despite being “mixed-race,” identify as black. But perhaps this is beside the point. Todd Levin does identify as white, and as Jewish. But do all of us have to justify our ability to curate certain material based on our genetic and cultural makeup? Some of the great collectors and chroniclers of African-American history have not been black. How much less full would our cultural heritage be without Carl Van Vechten? (A friend of Langston Hughes, this is a controversial figure that comes to mind offhand.) Or Robert Farris Thompson, one of the founders of the field of African Diasporic Art History? Are these people to be dismissed and their contributions ignored? My problem here is not only the deep misunderstanding of critical race theory—race as a social construct—but also the public bullying and race “outing” that have become de rigueur of late. Civil rights could not have happened without our Jewish, Latinx, indigenous, queer, white, and other allies. Or are we to be ashamed of their contributions and dialogues within black culture? Why was I also not outed as black and had to do so myself here? As Audre Lorde notes, does blackness eclipse all other modes of identification? Or can we perceive of identities on a spectrum while still highlighting black protagonists in a show such as “Power”? Does Levin’s Jewishness matter today? When a mere few decades ago it would have negated his whiteness. Or is everyone who looks like a white male supposed to retreat into a quiet corner? Akin to how Angela Davis recently exclaimed that “progressive men need to take the initiative themselves; they don’t need to be invited” to shift the problems of gender inequality. When they try to do so will they be publicly shamed based on their identity while the author hides behind an “objective” voice? Who are acceptable allies and who will judge them based on their identifications? And if so, who is to decide this? Will we then have to wonder if Wagley is equipped to do this because presumably she is a white cis gendered woman? Further down in her review, Wagley quotes a response to the questions I posed to all the living artists in the exhibition: “Why do exhibitions that are organized around identity continue to be important in our day and age?” This question has a complicated and far-reaching discourse in the field, which I cannot get into here but I encourage her to look up. I asked these questions before deciding to write the essay. Discussing the project with many of the black women artists that I respect deeply and have worked with over the years, Simone Leigh, Lorraine O’Grady, Steffani Jemison et al, they told me they were excited to take part in the exhibition. I wanted their voices to be principal. Wagley skews the meaning of my question and notes “the perversity of asking the artists to justify a problematically curated exhibition.” This would have been an opportunity for Wagley to discuss many issues but here she exposes her lack of grounding in African-American praxis and exhibitionary dialogues. There is nothing perverse about how important black women artists of previous generations were to living artists in the show. Some relate how they drove for hours to see work of other black women artists because too often they were not able to see the work in public. Many of the women wrote of and understand the variegated nuances of blackness . . . as not a stable signifier. For is the Ojibwe and African-American artist Edmonia Lewis really just black? (Except to the uninformed outside viewer.) Isn’t blackness not essentialized to biology, as Wagley in her antiquated reading would have us believe, but predominately culturally defined? (Existing in the gap between the fact of blackness vs. the lived experience of the black to paraphrase Fred Moten.) For many of these women artists, they looked to women whom the culture saw as essentially black for a path forward formally, conceptually but also in terms of crafting a career in the arts. For this reason, the pan-historical show “Power”—despite the shortcomings of doing any such project of this stature—contains the agency of these women. Many asked for their specific works to be shown alongside artists who influenced their practice, which was respected in the curation, but I had no hand in. Would a pan-historical show of white men, aesthetically curated and based on influence and dialogue elicit this response? Should I be able to write about Robert Rauschenberg, a white gay man from Texas? Or is the burden of racial specificity only to be upheld with shows outside of the majority? Of course because of my specialty I am inclined to exhibitions such as Catherine Morris and Rujeko Hockley’s “Black Radical Women 1965–1985” at the Brooklyn Museum and am excited about Mark Godfrey and Zoé Whitley’s “Soul of a Nation” at the Tate. But isn’t there room for a multitude of exhibitions of black artists, or must they all follow the stringent parameters of those few who have deemed themselves the gatekeepers of our progressive politics? 1 Wagley never identifies my race, though comfortably identifies Levin as white. She never mentions her racial identification so when a person’s race is used it appears quite pointed. I am a very dark-skinned woman born in Jamaica to black parents whose blood contains primarily the genetic makeup of enslaved West Africans brought to the island to work on the sugar plantations. My paternal grandmother is half Jewish and looks white. My maternal grandmother is part Carib, who were the indigenous population who occupied the island and later mated with escaped African slaves to form the Maroon population. My maternal grandfather is a half Indian (from Southeast Asia). Some of my cousins look white, my siblings are various shades of brown: all genetic co-mixture. I identify as black. 2 I do not know Todd Levin personally, in fact we have never met. I called and asked him over the phone if it was accurate to identify him in this manner. "POWER: Work By African American Women From The Nineteenth Century To Now"